Functions are equations where we use f(x) for the dependent variable y. This is a bit simplified, because it does involve a bit more. For a formal definition of functions refer to Dictionary.com. The simple definition involves variables and equations. We would plot the equation y = 3x +2 by assigning values to x and getting the values for y. If x = 0, then y = 2. If x = 1, then y = 5. For any value of x, the formula returns a value of y. You might say (and I will) that the value of y depends on the value of x. y is what we call a dependent variable, and because x can be almost anything, it is the independent variable. Now, because formulas will eventually become fairly complex, we want a way to show that the y value is dependent on x. We do that by writing it as f(x) instead of y. So, our formula becomes f(x) = 3x + 2. 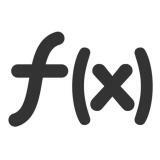 It's the same formula, only now we use f(x) instead of y in order to show a relationship between y and x. We usually write it as f(x) but we could write it as g(x) or h(x) they all mean the same thing. Two important concepts are the range and the domain. In short, the domain is all the independent values (we commonly call these x values). The range is all the dependent or y values in a formula. Each value of the independent (x) variable determines one value of the dependent (y) variable. The reverse is not necessarily true. Two different independent (x) values could have the same dependent (y) value. So, we are dealing with formulas that look like f(x) = 3x +2. If we want to show what this would look like when x = 7 we could write f(7) = 3x + 2 or f(7) = 23. There are many different types - bijective, injective, surjective, identity, constant, empty, additive, multiplicative, subadditive, superadditive, continuous, monotonic, analytic, smooth, holomorphic, meromorphic, nested, and others. It is my goal to be far more inclusive in these entries, but time is a factor. I am currently aiming the information at Algebra 1 level. When I finish, the plan is to work our way up through Geometry, Algebra 2, Trigonometry, Calculus, etc.. But, we have to start somewhere. Hopefully, it is obvious that, following the rules, a formula does not qualify if its graph doubles back on the y axis. There can be only one value of y for each x.